I have always loved this photo in the Posh Tots catalog and thought that these stencils would be adorable in a beach-themed room, bathroom, or playroom as shown below. 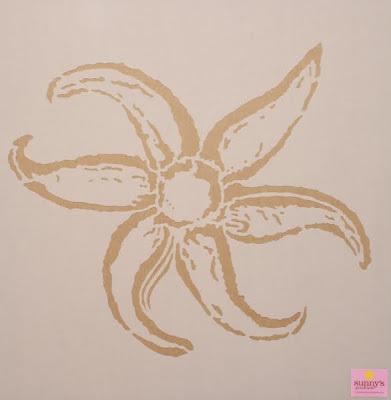 The starfish stencil and additional stencils are available on Posh Tots. The table and chairs shown in the Posh Tots photo above are by Art for Kids who actually recently just opened up their first flagship store in Los Angeles in Beverly Hills on Wilshire. The line is very expensive because all of their pieces are custom hand-painted to order but the quality of their paint-work is beautiful. If you live in the Los Angeles area it is a store worth stopping into. 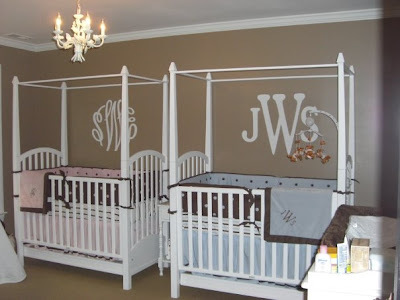 Another cute look for monograms, and especially fun with twins, is shown below over cribs. They are custom designed by The Pink Azalea. These are a little less expensive at $90 a pop instead of $155 . 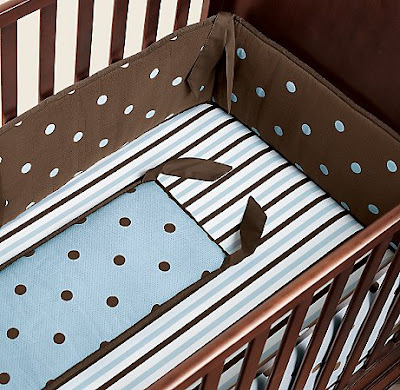 And in case you were wondering, the bedding is from Restoration Hardware Baby and Child.